The 10 Best Ice Skating Rinks in Ohio! While facilities stay open year-round, most people’s love of ice skating is sparked by the cold winds and snow rolling in. Here in Ohio, we have some of the best ice skating rinks you can find anywhere with classes, affordable (or free) equipment rentals, and clean, safe, family-friendly facilities. Here are the top 10 best ice skating rinks in Ohio. The OSU Ice Rink has open skating for all ages, skating lessons, hockey lessons, and many clubs & organizations. The on-site pro shop rents supplies and equipment for figure skating, ice hockey, and inline skating. Center Ice Sports Complex in Canton has an open skate schedule throughout the week and lots of skating programs for classes, teams, and organizations. You can reserve the rink for birthday party packages with pizza, pop, party supplies, and more included. The Chiller has several locations throughout Columbus and is sponsored by Ohio Health Works. They offer classes and camps for skating, hockey, and figure skating. Public skating is available throughout the week. Northland Ice Center hosts frequent hockey and figure skating competitions. They offer ice hockey leagues for adults as well as children and classes for beginners. Skate rental and trainers are free with the price of admission and open hockey for all ages is just $10. Cleveland Heights Community Center boasts an Olympic-size ice rink and a second standard-size rink. The two-rink schedule allows them to offer a variety of activities including, speed skating, synchronized skating, adult, public sessions, adaptive skating, and sled hockey. The OBM Arena is open year-round and provides a safe, family-friendly atmosphere. They're open for party rentals, open public skating, hockey, and figure skating. They also feature drop-in hockey, drop-in freestyle skating, and all-ages classes. 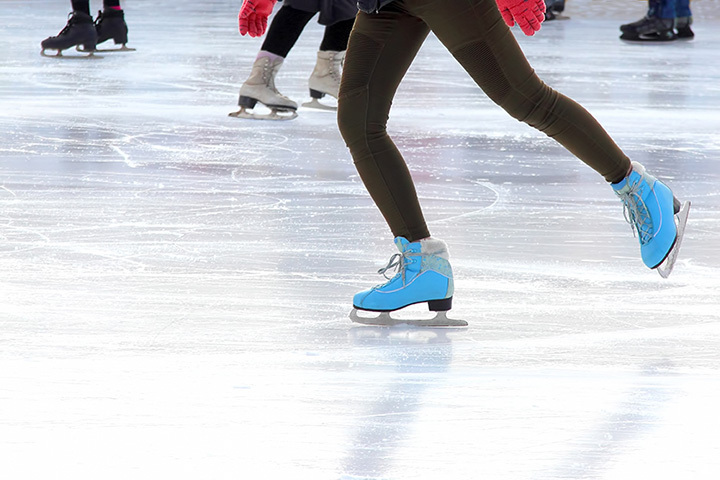 The Pond is a family-friendly ice rink located in Chagrin Falls. They offer affordable and customizable packages for birthdays and parties, as well as the complete offerings of classes, hockey, and figure skating. Public skating is open Monday through Friday, 12-2 p.m., Friday nights, 7:10-8:40 and weekends, 1:30-3 p.m. The Alice Noble Ice Arena is open year-round for public and private sessions. They offer free holiday skating to the public on certain days and offer youth clubs for figure skating and hockey. Public skating is open Monday through Friday from 12 to 1:30 p.m. Thursdays are free! The C.E. Orr Ice Arena is open to the public and offers a wide variety of skating-related classes from beginner to advanced-level skaters. You can reserve time slots on the ice on a first come, first serve basis for private parties or sessions. The Gilmore Academy Ice Arena draws over 300,000 visitors yearly and is home to hundreds of hockey and figure skating events throughout the year. There are classes for everything from hockey to the basics of learning to skate, and public open skating is available Saturdays and Sundays at varying times. View more Ohio Ice Skating Rinks.